You will need a Bitcoin wallet in order to check out. You can get one a Bitcoin digital walletHere. Make sure you have enough funds to pay for your domain(s) you want to purchase. Shop like you normally would and add the items you wish to purchase in your cart. Proceed to checkout and login if you're a current customer, or create a new account. Select 'Bitcoin" on the Payment Page. Now you'll have 3 ways to pay with Bitcoin. You will have ONLY 15 minutes to complete the transaction. 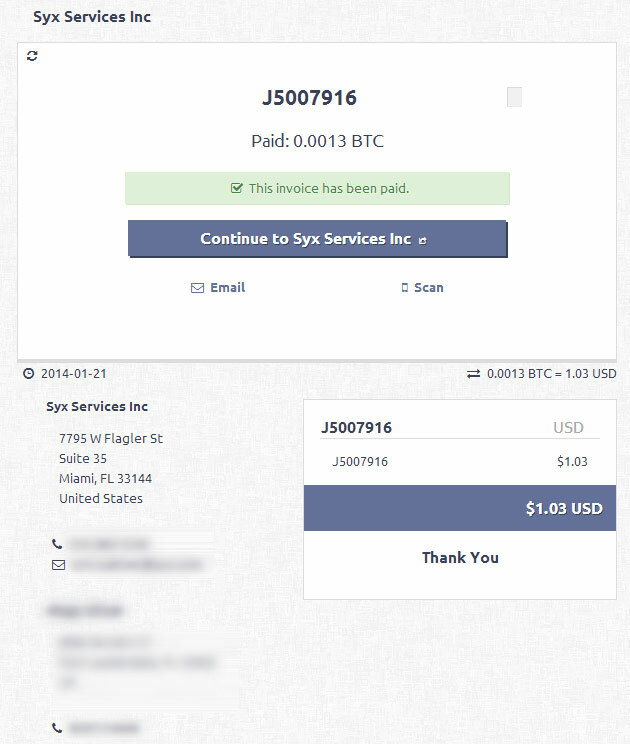 If your order went through successfully the page will update showing you a message "This invoice has been paid." At this point you can either scan your receipt into your Bitcoin mobile wallet or you can send an email with the link to the receipt to yourself. You can view a copy of your invoice either in your Bitcoin mobile wallet, Bitcoin web wallet, Bitcoin wallet installed on your PC or you can grab the url after selecting email and view it in the browser. Go back and choice another payment method, not Bitcoin. If you want to pay with Bitcoin then you will have to go through the process again. Bitcoin is an experimental, decentralized (not controlled by any organization or government) digital currency decentralized peer-to-peer payment network that is powered by its users. Bitcoin is like cash for the Internet. A Bitcoin wallet is a digital wallet that stores your Bitcoin balance and allows you to transact with other users online and offline. All wallets can communicate with each other similar to emails, so you can send to and receive bitcoins from anyone regardless of the type of wallet they use. Digital wallets can be stored on a PC, a smartphone or can be hosted online by wallet providers like Coinbase. The Bitcoin technology - the protocol and the cryptography - has a strong security track record, and the Bitcoin network is probably the biggest distributed computing project in the world. According to bitcoin.org all security breaches happened on diverse exchanges and businesses but none of them involve Bitcoin iteself being hacked. Bitcoin transactions are final. Once you have sent Bitcoin funds to BitPay to complete a order, they cannot be reversed. This is a core feature of Bitcoin currency. All Bitcoin transactions will be communicated in US Dollars (USD). The exchange rate provided at time of purchase by our partner BitPay will be valid for up to 15 minutes. If payment is not completed during that time, your order will expire. An expired order can only be paid by another method of payment such as a conventional Credit Card. Customers outside the US should check the laws of their country for laws regarding the use of Bitcoins as currency. We assumes no responsibility on usage of Bitcoins as currency in countries that do not allow the use of BitCoins as currency. We are committed to accepting Bitcoin. However, our acceptance of Bitcoin as a form of payment, and these terms and conditions, may change at any time, for a variety of reasons, at our complete discretion and without any advance notice whatsoever. Please refer to these Terms and Conditions, along with our Support Helpdesk, often for our most current published information related to Bitcoin and BitPay.